A Texas teen arrested in September for bringing what school officials initially suspected was a bomb is now demanding $10 million from the city of Irving, Texas and $5 million from the Irving Independent School District. Ahmed Mohamed, 14, would also like a written apology. A time limit for Mohamed’s request has been set at 60 days, after which, his attorneys say, they will file a formal lawsuit. Mohamed’s story received national attention when his sister posted photos of his arrest on Twitter. Now dubbed “the clock kid,” Mohamed was not charged with making a bomb but was suspended from school. 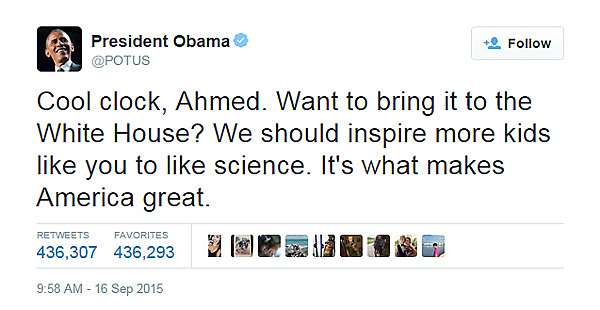 President Obama later invited Mohamed to the White House and photos of the meeting were posted to Twitter. Obama stated that more kids should be inspired to like science. While most of the attention Mohamed and his family received about the arrest was positive, his attorneys indicate the child will experience pain and suffering for the rest of his life because of the event. Mohamed’s father moved the family to Qatar shortly after the arrest in an effort to ensure the Mohamed children are able to study and learn and be accepted by the country. Mohamed tweeted in early October, “Qatar is Amazing! !” Mohamed met with dignitaries of the United Nations before his move to Qatar. The Mohamed family was involved in at least one other bomb related incident when Ahmed’s sister, Eyman Mohamed, was suspended from school after another student reported that Eyman wanted to, “…blow up the school…” Eyman denied any involvement in the plan. Also reported by the Dallas Morning News is Mohamed’s alleged previous suspensions from school for, among other things, building a remote control for a classroom projector.